The Royal Botanic Garden Sydney is turning 200 this year. 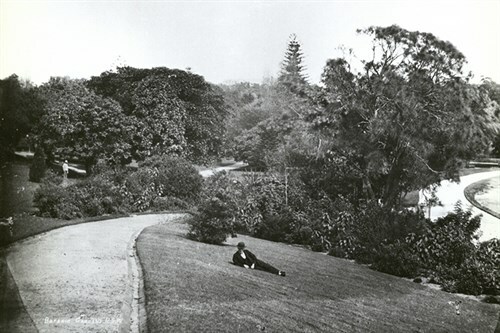 The garden was founded by Governor Macquarie in 1816 as part of the Governor's Domain and is the oldest botanic garden in Australia. The entire site is 64 hectares which includes the Domain (34 hectares). Being a botanic garden it supports a huge number of plant species (8,900) and also houses in the Herbarium some 1.2 million specimens. Much of the groundwork for the success of the gardens is attributed to Charles Moore, who was the Director of the gardens for 48 years. He vigorously tackled the problems of poor soil, inadequate water and shortage of funds to develop much of the Gardens as we see them today. He is also responsible for the Palm Grove at the heart of the Garden and is an excellent reminder of his skill and foresight. 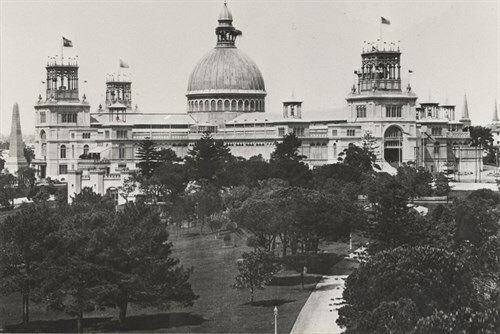 In 1879 a substantial area of the Domain (south of the Conservatorium of Music) was used for the building of the Garden Exhibition Palace which was constructed for the Sydney International Exhibition. Built of wood with towers and turrets around a giant dome (30m) in diameter surmounted by a lantern 64 metres above the ground and was constructed in just eight months! This building had a footprint equal to 180 tennis courts! It rather resembled a cathedral in shape and London's Crystal Palace in design and covered two hectares. After the exhibition it held a lot of government records and Aboriginal art work. Unfortunately the building and its contents were completely gutted by fire in the early morning of 22 September 1882 and the land, now known as the Palace Garden, was added to the Botanic Garden. 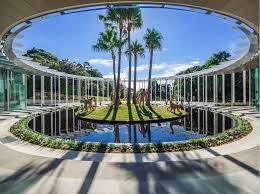 As part of the celebration for its 200 year history the Botanic Garden opened a new attraction called The Calyx. This new addition is integrating the Arc glasshouse (completed 1987), however the pyramid glass house (opened 1972) has been demolished to make way for this new addition. The name 'Calyx' refers to the whorl of sepals that protect a developing flower bud and the steel frames radiating from the centre creating a doughnut-shaped building is representational of that. The area in the centre of this area is ringed by a mirror pond, with a raised area in the centre which can be used for exhibitions etc. Currently this space is taken up with some mondo-covered sculptures of howler monkeys. The inside space of the Calyx is just stunning. It houses the largest interior continuous green wall in the Southern hemisphere. This living wall is 51 metres long and 6 metres high and features a staggering 18,000 individually potted plants including curly parsley, alternantheras and heucheras thriving in their vertical home. Each morning Horticulturalists tend to the wall before it opens maintaining and replacing any plants that need it. Each plant is in an individual pot so pots are easily exchanged. This wall is intentionally designed for ALL visitors, including children who might want to crush the leaves of a chocolate mint to smell the aroma. The maintenance of this wall is supported by a high tech production house which has three chambers - each with different climates where exotic and native plants are grown for the Calyx. Adjacent to the wall is the first feature exhibition 'Sweet Addiction: The Botanic Story of Chocolate' where you can taste, touch, see, hear and smell all things CHOCOLATE! This exhibition traces the story of chocolate from bean to bar and centres on a miniature Amazonian rainforest with cocao trees, vanilla orchids and flamingo flowers. And there are interactive exhibitions and video installations that touch on the ecological issues surrounding chocolate production. For further reading and more images check out this link from green magazine, a publication for inspirational stories on sustainable design. The Sydney Morning Herald have done a wonderful article and you can see it at this link about the history of the gardens.